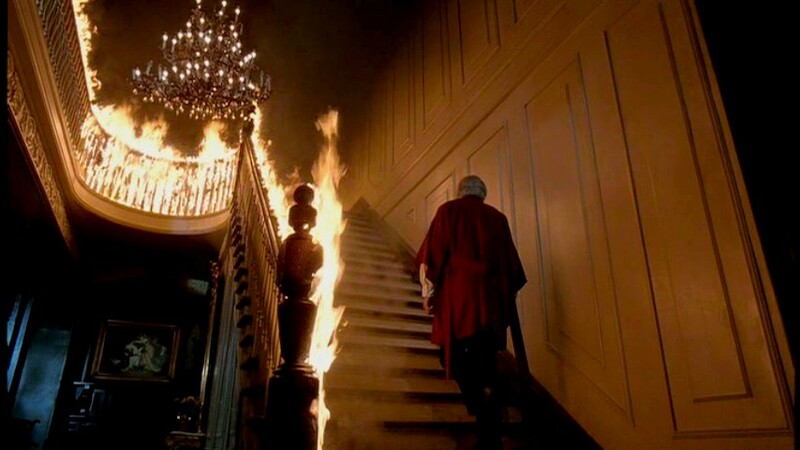 Any late-comer who watches The Changeling (1980) will have to contend with its considerable reputation, at least in the more discerning circles in which it is praised. Based on supposedly true events that writer Russell Hunter experienced while he was living in the Henry Treat Rogers Mansion in Denver, Colorado, the film won the first ever Genie Award for Best Canadian Film as well as awards in many other categories. Martin Scorsese placed it on his list of scariest movies of all time. The plot follows a musical composer (George C. Scott) who is torn by grief, having just lost his wife and daughter, as he relocates to Seattle to concentrate on his music and to begin lecturing at a local university. He rents an old mansion owned by the historical society because of its music room and soon starts experiencing loud bangs and doors opening on their own. It isn’t long before he realizes the ghost of a child killed eighty years prior haunts the place, whose murder was covered up, and to further matters there may be a connection to a wealthy old senator. The Changeling is filmed beautifully and the sets are terrific. The mansion is huge and exquisitely carved, yet manages to still feel claustrophobic and foreboding. The musical score is enchanting, often appropriately reflecting the main character’s piano numbers. The script unravels a very good plot as the secrets regarding the ghost’s origins are revealed, and the history-nerd in me is always a sucker for horror movies in which the characters are seen searching through old documents and libraries in the hopes of finding answers. The cinematography, too, is impressive and the shots well-framed. There are definitely some scenes that will linger in the mind after viewing, particularly the séance. The most haunting for me is the one where a mother describes her daughter screaming in the night that a boy was trying to crawl out from her bedroom floor. It’s the imagining of the scene that is more effective than if it had been shown. And the wheelchair scene is of course iconic, if admittedly a bit silly. George C. Scott’s performance has often been hailed, and while it didn’t affect me personally I can see why others might be moved by it, and the supporting cast does well enough, including Scott’s wife, Trish Van Devere. It was also nice to see Melvyn Douglas playing the aged senator. He would go on to star in another ghost movie, Ghost Story (1981), the following year just before his passing. At the beginning of his career he had starred in James Whale’s Old Dark House (1932), one of my favorite horror films of the 1930s and an early example of campy humor being infused into the genre. As a genre fan it’s great to see an accomplished actor with such a long résumé bookend his career with notable horror entries. And for those fellow Trekkers out there, the guy who plays De Witt is John Calicos, who played the first Klingon in the original series and who would memorably reprise that role in Star Trek: Deep Space Nine. The Changeling is a good ghost yarn with many strong aspects. It attempts to tell a creepy ghost tale with class and relative minimalism. In my opinion, it has been surpassed by subsequent haunting movies, and calling it one of the scariest films of all time is a considerable overstatement. Nevertheless, it’s still a classic worthy of respect and worth seeking out. I just discovered your blog and I’m enjoying all of your posts. This movie in particular scared the hell out of me, particularly the scene with the ball bouncing down the stairs. I agree that it definitely could have been edited more and parts of it are very dated, but it still has the power to scare the hell out of me. Great review.